And what's that? Do I hear Monster 184? Now, I have a little something extra to talk about today, and I hope you'll bear with me. Yesterday I got to see a screening of ANVIL: The Story of Anvil. (Thank you for the invitation, David!) 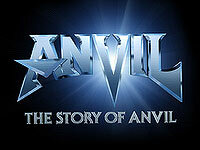 It's a documentary about the band Anvil. In the early 80s they were set to be huge, but then got left behind with the advent of Metallica, Megadeth, et al. Well, they didn't do the sensible thing and hang it up. They just kept on going, making records, playing gigs wherever they could find them. They also took straight jobs to keep their families fed. Director (and former Anvil roadie) Sacha Gervasi shows the band as they are today, working around Toronto, taking on a tough, tough tour of Europe, making their 13th album... making do. Somebody at the screening said "I didn't expect a metal documentary to make me cry." Exactly! Now, I admit that I'm a soft touch, but the story of these guys was so sweet and inspiring --- you'd have to be made of stone not to be moved by their dedication. These guys are an absolute monument to following your dream long past the point where most anybody would throw in the towel --- and to do it from a point not of desperation, but of joy. It's simply a recognition of "Well, this is what I do. What else am I gonna do? Quit?" Me, if there is something I want to achieve, and I can't make any progress at it for a few weeks or months, I get cranky, if not downright depressed. These guys have been slugging it out for 30 years. And there was not a hint of bitterness in them. As Steve "Lips" Kudlow, the singer, guitarist and songwriter of Anvil says "I just want to rock." 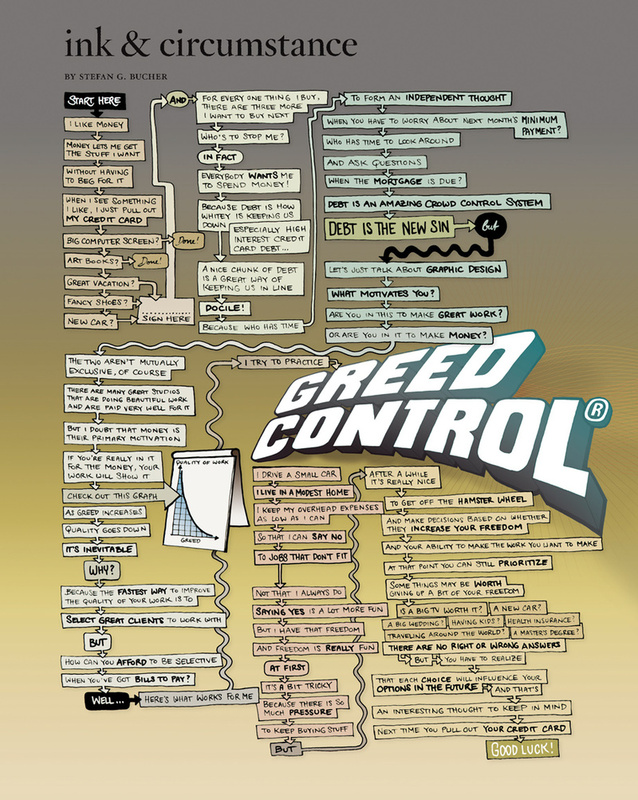 Those of you who have heard me talk about Greed Control® will recognize the spirit. They are Greed Control®. Click on the image for the full column. After the screening I had the pleasure of speaking with Lips for a little bit, and he's just an absolutely sweet, humble guy, who had such excellent things to say about sticking to the things you love, and about making it on your own terms. The man drives a truck for a catering company during the week. "It's not my favorite thing, but it lets me keep my band going. There are ups and downs in life, but you just keep moving, and as long as you get to do what you love, it's all good." I'm quoting from memory here, and I'm mangling it all terribly, I'm afraid. But I just came away from the whole thing entirely inspired, and had to tell you about it. If you're feeling a little bit exhausted from working towards an irresponsible, pie-in-the-sky, far-away goal, or if you're debating on whether you should follow your heart in whatever you do... try to see this movie. It'll give you the energy you need to stick your head back into the clouds. You can start with the video clip excerpts at the movie website. If you have an opportunity to host a screening at your school or agency or studio, get in touch with the filmmakers at the official movie site. More immediately, support Anvil by picking up their new album at their site. I did, because.. well.... how can the Monsters of Ink not support the Monsters of Rock? It’s transforming into an angel perhaps, or a fallen one… or a butterfly or an other flying object… who knows? People are always surprised that the Freakin’ Fantastic Funnelmonster flies. They look at the giant beak, they look at the tiny wings–they say, “no, not possible”. The ones who do believe it can fly want everything to be the same; they say, “oh, it flies like the bumblebee flies!” They’re surprised, too. Because, you see, the FFF ffflies by exhaling out its legs. It is fffast, too, just like a rrrocket. It points its legs to change direction and lands ever-so-elegantly on its hhheels, using its wings to slow down. And then it laughs, because the expression on the faces of the people watching is just so fffunny, every time! He wears the cape to cover the vestigial tail. We tried to tell him that it was no big deal. I suppose it’s hard to hear that a tail doesn’t matter, especially when you are three feet shorter than all of your friends, and you can’t close your mouth all the way. He wears his pumps, his famous pumps, so as to dissuade onlookers from noticing his tail, his height, and his disproportionate teeth. He cries some more, loudly now, and the man on the cell phone leaves. We bring him home and force him to take off his pumps and his cape. We look down to him and try not to stare at the lump on his back. We tell him we love him, and he begins to tear up. We stoop down to hug him, and he tries to tell us something important. We cannot understand him, however, because his teeth clank together, and we hear a cluttering like wine glasses toasting. Beebus Ingno yawned lazily into the two-way mirror. Staring back at her was a teenager giddily trying on the latest in screw-in fashionables. Bloobman’s had a sale this week on RunWay Flipper dorsal fins, buy two get two. Beebus wrinkled up her nose. She never remembered being like that when she was younger. The parade of department store fashion went on tirelessly as the sale came to a close. Beebus stood up, and put her Vibvanni jacket over her ProtoNow triple-cufflinked elbow diamonds and exited through the Loss Prevention door like a seasick head of state. The thought of those squeaky, uncouth girls today filled her mouth with the taste of handled pennies. This was her store. How dare they assume they knew everything about fashion? ‘How…grello.’, she snarked into the empty parkinglot. The word hung in echo to only her ears then faded, leaving her alone and shoveled upon with years of department store stuff. Frank the fish found a pair of fancy feet. Frank figured he’d fuse with them; now he’s complete. Frank’s the only freakin fish with them on the streets. Frank’s foot figure fits them fabulously. Frank’s face can’t help but unfurl a full smile. Frank fumbles and stumbles; he swims away, the feet follow. OMG! I remember ANVIL! I’m pretty sure I have some of their vinyl too! I had no idea they were still rockin’ out… and with 30 albums? WOW!!! When Squibbles retired, the Professor took over his physics class. At first, it was difficult to fill his shoes. In fact, the Professor inherited Squibbles’ high heels and had no choice but to take this honorable gift. After several lessons and teachers, he figured out how to walk in these things. Something wasn’t right at the walking gym, though. It was so hard to walk in theses shoes, the Professor fainted quite soon after the training began. When he regained conscience, the instructor was gone. Lucky for him, he always kept enough change in his pockets. 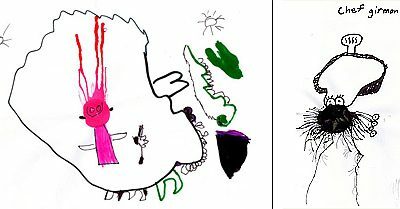 The Professor became acquainted with his group of students, especially with a toothy fella named Alcanite. He seemed to be very attentive during the lectures. And he always participated in the experiments, even the dangerous ones. On that day, the Professor brought a portable black hole to class for further examination. When everyone gathered around it, they heard a sound coming from above. Once they looked up, it was already too late. An object in the size of a nut fell onto Alcanite and he tripped into the black hole. There was a white flash and then darkness. Nobody dared to open their eyes.